The crew finds a bomb. And so did we. Eesh. It has been brought to my attention that a number of you are stroking warheads. Therefore, I will step aside and open up the floor. Kevin: It feels like they got an algorithm to review all the TOS scripts and then spit out one on talking a robot out of bad behavior. This episode hits the plot marks, but there's no actual structure on the scaffolding, no meat on the bone. We get a tepid head nod to the idea of Harry growing on the ship, but it's always too little, too inconsistently to really make me care. I mean, Tom got demoted than re-promoted in less time than Harry has been an ensign. I also don't think the conflict for Harry at the top of episode was that big a question. An apparently sentient being explicitly requested help. If it were anyone other than Harry, after a perfunctory "put up a forcefield" line, they would have done it, no further questions asked. This is just another plot element that they technically did do, but didn't do anything with, if that makes sense. Matthew: I think this script would be helped if they hadn't leapt to the "sentient being" thing so quickly. I know it's tough to write, but I would have liked to see a more teased out revelation of that, perhaps in conversation. It could get at what the heck they mean by "sentience" in the context of Star Trek. Does it mean to have self awareness? Feelings? Second order thinking? As it stands, this warhead just seems focused on its mission. Kevin: The problem here is first, an increasingly recurring one for Voyager: we've been here before, and not just that, but we've been here before on Voyager and not just in the franchise at large. If you add Dreadnought to Prototype, neither a perfect episode to begin with, you get this episode. Second, there's just nothing to hang your hat on in terms of caring about the story. The personality of the bomb precludes sympathizing, and the complete absence of the makers or the target planet make it a complete dead zone in the story. What we're left with is just watching Harry repeatedly ask, "Have you tried NOT being a bomb?" like it was some revelation. None of the parallels he was trying to draw between the bomb and other artificial beings had any evidence in the episode to support making such a comparison. Matthew: Yeah, there seemed to be an angle of "Harry learns to appreciate the Doctor, in comparison with this rigid sentient Jerk Bomb." But the Doctor's basic value as a person has already been asked and answered many times. Is it about "Harry learns to take command?" I guess that was fine-ish, inasmuch as we got some decent character interactions with his friends and crewmates ribbing him over his "by the book" persona, but then, wasn't that quashed in "The Disease?" Ultimately, there's not a lot of intense interest or lasting consequence to be had here. Kevin: The most successful part of the episode, and that's being generous, is watching the crew try to outwit the bomb. It's not great TV, but watching Janeway spar with the merchant and the crew try to come up with a riff on a heist plan at least had dialogue that didn't put me immediately to sleep. Matthew: I found the dealings with the salvage merchant to be filler. Kevin: Robert Picardo tried. I mean...he tried. I cannot imagine a harder brief for an actor than "Be a bomb with no other defining personality traits." Even if their techonobabble hook had somehow integrated the bomb into rather than over the Doctor, there could have emerged an interesting synthesis. Alternating between menacing whispering and barking about his MISSION for 45 minutes was painful to watch, if only because I couldn't help but think "Why did you do that to Robert Picardo. He's a nice man. You give him better scripts with more emotional nuance. He's earned that," over and over again for most of the episode. 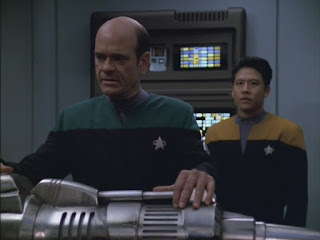 Matthew: This was not Picardo's finest hour, but he wasn't given much to play with here. No emotions beyond threatening anger and irritation. No grand speeches about the nature of sentience and personhood. It was all a big "meh." Garrett Wang was reasonably OK, but not a whole lot more. Better were Harry's friends relating their experiences to him, such as B'Elanna and Tom. Kevin: Not a lot here. Beyond a clear use of the 'rocky clearing' set, this was a bottle show. The bomb itself looked like some kind of missile. So...yeah. There you are. The doo-dads on the outside were fine. Not terrible, but nothing noteworthy. Gray missile shape covered in blinking lights. Not much to add there. Matthew: I only point it out because they gave it a close-up, but I'd like to know how 4 tiny round buttons on the exterior of the missile 1. don't get pressed accidentally all the time, and 2. can do really complex stuff like lock out command functions, set up shields, etc. The missile was a miss. I think it needed something more to personify it, maybe a screen or something. Now, I understand that we should be challenged to accept the personhood of non-anthropomorphic objects. But the script didn't give us enough, and then they just defaulted to taking over the Doctor, who looks like a human. Kevin: This is not an episode. It is a pitch for an episode that was stretched to 45 minutes in lieu of someone actually writing the episode. I am this close to a 1, but even that feels like a reward it didn't earn. This is not as gleefully bad as Threshold or actually, profoundly bad as The Thaw. It doesn't merit being mentioned in the almost reverent tone one adopts when listing the Worst Episodes Ever. This just squeaks into a 2 for me. Matthew: Yeah, this episode is pretty lame, but I do think it has some redeeming aspects. Character interactions mostly. Tom was desperate for dating supplies for his anniversary, right? But overall I agree witht he 2 for a total of 4.